Our air powered vacuum pumps are compact and lightweight. 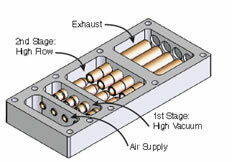 Consequently they can be mounted closed to the point of use to minimize the internal volume of vacuum hose and tubing. This creates the shortest evacuation time. We have many configurations of single-stage and multi-stage vacuum pumps. This means you can select the precise product that will best fit your application. The differing series of nozzles gives the system designer a wide selection range instead of the one size fits all approach. EDCO vacuum Chip pumps were named after electronic circuit chips whose small size and versatility have made modern products more efficient, compact and affordable. 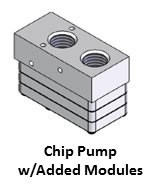 Our low-cost Chip pumps will do the same things for your vacuum systems. Chip pumps provide the performance you expect from a multi-stage, multi-ejector, air powered vacuum pump. To increase pump capacity, we simply add another pump module to the assembly stack. 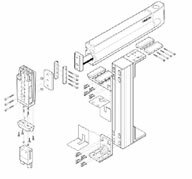 To make your system easier to design and install, we offer non-return valves and direct mounted electronic sensors. Suction cup is the usual industrial term for a vacuum cup. Most cups are round because that is a strong shape that resists collapse under vacuum pressure and it efficiently distributes load forces through the cup walls to the fitting. A circular shape also provides the greatest area for the amount of space it occupies. Industrial cups usually employ a metal fitting for mounting the cup and for connecting a vacuum source to allow the inner volume to be evacuated. Suction cups are made of rubber and include a flared lip to form a flexible seal against a work piece to allow the cup to be evacuated with a vacuum pump. Several cups can be connected to a central pump, or, a small vacuum pump can be used for each cup. AMERIFLEX: For general-purpose normal ambient temperature applications as a replacement for competitors’ PVC vinyl cups. DURAMAX: Softer non-staining, non-marking, general-	purpose material for high-visibility surfaces at normal ambient temperature. NITRILE: For general-purpose normal ambient temperature applications. SILICONE (S): For either cold or high-temperature applications or where greater flexibility will improve conformance to a part. CONDUCTIVE SILICONE: For grounding parts such as electronic chips to eliminate static electricity. VITON: For extremely high-temperature applications in automotive, appliance or other applications where silicone is not allowed. In addition to vacuum we have many options for handling parts. Our solutions range from standard angular grippers to electric grippers to Festo’s cutting edge bionic adaptive grippers. Standard handling modules are designed to save you time and money. Because they are pre-engineered precise load capabilities and cycles times are well defined. Standard adapter plates are available to mount the vacuum or gripper components of your choice. For advanced handling units refer to our Mechatronics section to see examples of what we can for you!